The students in front of the Auberge de Castille (from left) Owen Bonello, Aidan Bugeja, Shania Buhagiar, Therese Buhagiar, Martina Camilleri Brennan, Kaylee Falzon, Kirsten Farrugia, Luca Magro, Matthew Megrahi, Kieran Schembri, Raisa Scicluna, Joy Thomas Karolyn, Chantelle Vella and Maria Wilson flanked by their teachers: Martin Azzopardi and Joanne Dalli. 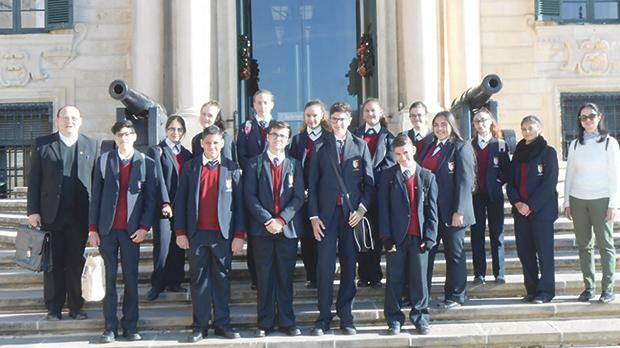 Form 4 students at St Margaret College Senior Secondary School, Verdala, Cospicua, recently took part in an excursion to Valletta aimed at enriching their cultural knowledge. The participants learnt about the symbolic architectural and artistic meanings of the decorations of some of the city’s main buildings and sites, including St John’s Co-Cathedral and its museum, the Grandmaster’s Palace and armoury, the Upper Barakka Gardens, Auberge de Castille, Our Lady of Victory chapel, St Catherine’s church, Palazzo Parisio and the old court building, the Castellania. Among the many paintings that they viewed was Caravaggio’s Beheading of St John the Baptist, the largest painting in the world by this famous artist and the only one he signed. The excursion was organised by teachers Martin Azzopardi and Joanne Dalli. The authors are students at St Margaret College Senior Secondary School, Verdala, Cospicua.